Allow me to first introduce myself before I take you down into the rabbit’s hole that is this blog. I am a creative, crazy, foulmouthed broad but you can just call me Lynn. I am here to show you some simple and not so simple creative DIYs to spark your imagination or even copy. Allow me to explain to you how this whole crazy blog began. One day the husband and I were sitting down, discussing our plans for our library and while we were having said discussion, we came to the realization that most of our home has a very Steampunk feel to it with our current decor (not to mention we even like the genre). 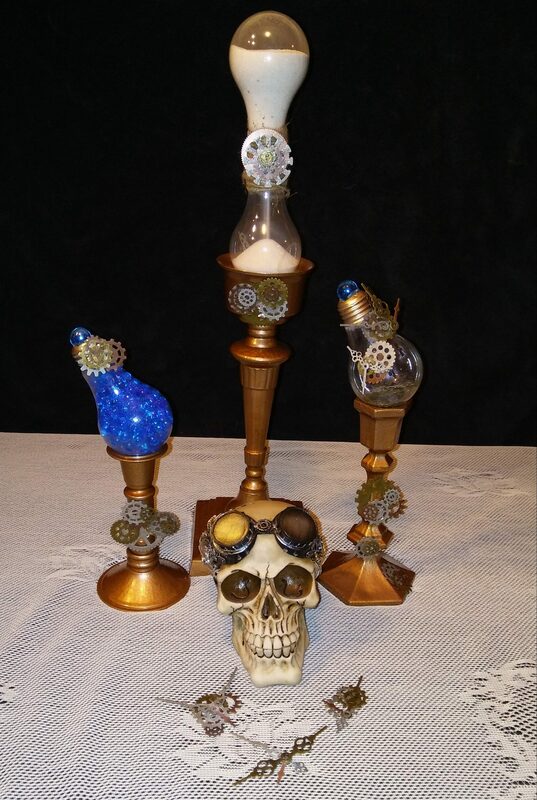 Then came the joys of me looking up Steampunk home décor on Pintrest and the internet in general and found it…..lacking. So I began to ponder and think on how I can make things Steampunk without adding gears to everything, because really that is just so cheesy and overdone. So what is Steampunk? Anyways, back to Steampunk home décor, as I have discovered and I am sure that my fellow readers can also attest to, it is slightly difficult to find. This has led me to create Steam and Lace DIY so that I can share my ideas with my fellow DIY crafters. Every week I will attempt to write a new entry, hopefully with pictures to show said work, I am horrible at remembering to take picture and I am slightly bad at taking them as well, and describe to you what newest project it going on in my household. So hold onto your hats ladies and gentlemen as I take you on this fun ride of Steampunk DIY. Next week I will bring to you: Footlocker that can twisted and hammered into being an end table.